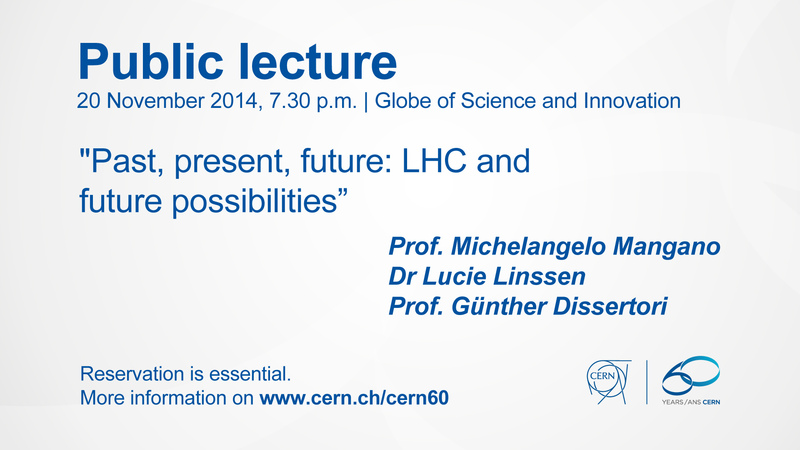 Public conference “Past, present future: LHC and future possibilities” by Michelangelo Mangano, Lucie Linssen and Günther Dissertori. Talk in English with simultaneous interpreting into French. Entrance free. Limited number of seats. The discovery of the Higgs boson is the most significant outcome so far of the LHC experiments. This discovery addresses issues in our understanding of nature that have been on the table for almost 50 years. It also provides us with a more solid basis from which to continue our exploration of the other open problems in particle physics, such as: what is the nature of dark matter? What is the origin of matter? Do all forces of nature unify? The future programme of the LHC and the future facilities that CERN is planning, which will be presented in the following two talks, are tailored to address these questions. M. Mangano studied theoretical physics at the Scuola Normale Superiore (Pisa, Italy). He held research appointments in the Physics Department of Princeton University (1984-86), in the Theory Group of the Fermilab Laboratory (Chicago, 1986-88), and in the Pisa laboratory of INFN (Italy, 1989-95). Since 1995, he has been working in the Theory Group at CERN. His research activities are focused on the study of high energy particle collisions, with a view to understanding the fundamental laws of nature through the observation of particle interactions. Between 1988 and 2000, Mangano worked with the CDF experiment at Fermilab, where he contributed to the discovery of the top quark. Since 2009, he has been running the LHC Physics Centre at CERN, which contributes to the interpretation of the data emerging from the LHC. The Compact Linear Collider (CLIC) is a linear accelerator currently under development. CLIC will allow the study of high-energy collisions between electrons, e-, and positrons, e+. Unlike protons, which collide in the LHC, the electron and its antiparticle, the positron, are genuine point-like particles. Proton-proton and electron-positron collisions are governed by different elementary forces. In general, electron-positron collisions can be studied to higher precision and provide information that is complementary to what can be learned at the LHC. The on-going CLIC accelerator development work, the physics questions CLIC can address and the corresponding particle detector will be described in the presentation. Lucie Linssen is a senior physicist at CERN, where she has been employed since 1986. She obtained a Masters degree in physics from the University of Leiden in the Netherlands in 1981 and a PhD from the University of Amsterdam in 1986. She specialises in the design, optimisation and construction of particle detectors and of complete particle physics experiments. Within CERN she has held technical coordination roles for the construction and operation of particle physics experiments and has served as the deputy department leader of the CERN Physics Department. She is currently the spokesperson of the CLIC detector and physics collaboration (CLICdp), involving the design, technology R&D and physics studies for a large experiment at a possible future linear e+e– collider near CERN. The Large Hadron Collider (LHC) with its 27 km circumference is currently the largest accelerator in the world. While there are still many exciting years ahead of us with the experiments at the LHC, particle physicists are now starting to develop visions and even first concrete proposals for the next big step in terms of a circular collider at CERN. The Future Circular Collider (FCC) will be a record-breaking project in many respects, such as in terms of its overall size and the collision energies to be reached. This presentation will explain the motivations for planning towards an FCC, describe the first ideas and proposals, and highlight some of the technical challenges which will have to be faced. Guenther Dissertori studied physics at the University of Innsbruck, Austria. In 1997 he obtained his PhD in physics, for a thesis on theoretical studies and experimental data analyses related to the ALEPH experiment at CERN’s electron-positron collider LEP. From 1997 to 2001 he worked at CERN, first as a research fellow and then as a research staff scientist. During that time he continued his work on the ALEPH experiment and started his involvement with the CMS detector at the Large Hadron Collider. In September 2001 he became an assistant professor at ETH Zurich. Since 2007 he has been a full professor and he is currently the Head of the Institute for Particle Physics. The main focus of his research group is on the operation and physics exploitation of the CMS experiment.